Drawings for Figure 430XL — Brass Body, Full Bore Ball Valves, XL Press End, 200 PSI Water, 2-1/2" to 4"
Drawings for Figure 430 — Brass Body, Full Bore Ball Valves, XLC Press End, 200 PSI Water, 2-1/2" to 4"
**The FNW large body figure 430 press valves (2-1/2" to 4") are available in two distinct end types, XL and XLC which are for installation using crimp tools equipped with matching XL or XLC jaw sets. ***4" XL valves are for copper pipe or copper fittings only and should not be used on brass fittings or adapters. 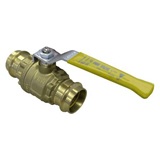 ****All XLC valves are for copper pipe or copper XLC fittings only and should not be used on brass fittings or adapters.